Image Caption: The earliest dust and rocks forming in the solar nebula. Credit: NASA. A long standing mystery in the formation of the Solar System has been solved by cosmochemists from the University of California, San Diego (UCSD). In the oldest, most pristine rocks, oxygen, the most abundant element in the Earth’s crust, follows a strange, anomalous pattern that must result from a different chemical process than the well-understood reactions that form minerals containing oxygen on Earth. 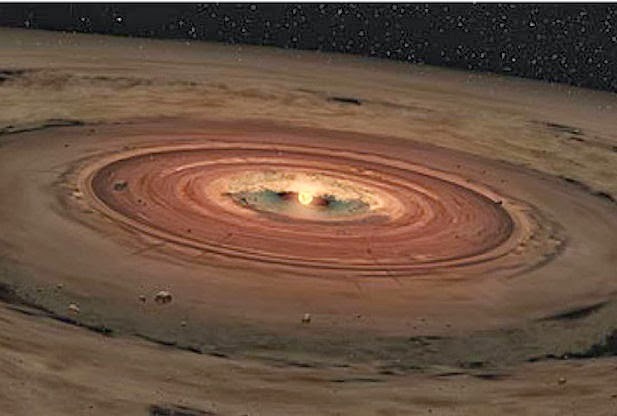 The researchers re-created conditions in the solar nebula, the swirl of gas that coalesced to form our star, the planets and the remnant rocky debris that circles the Sun as asteroids to demonstrate that a simple chemical reaction, governed by known physical principles, can generate silicate dust with oxygen anomalies that match those found in the oldest rocks in the Solar System. The results of this study were published online in the early edition of Science. The discrepancy was noted forty years ago in a stony meteorite that exploded over Pueblito de Allende, Mexico. It has since been confirmed in other meteorites, which are asteroids that fall to Earth. These meteorites are some of the oldest objects in the Solar System, believed to have formed nearly 4.6 billion years ago within the solar nebula’s first million years. The mix of oxygen-16 (the most abundant form with one neutron for each proton) and variants with an extra neutron or two is markedly different in the meteorites than that seen on terrestrial Earth, the moon or Mars. In most instances, oxygen isotopes sort out according to mass. Oxygen-17, for example, has just one extra neutron and is incorporated into molecules half as often as oxygen-18, which has two extra neutrons. In these meteorites, however, the rate at which they were incorporated was independent of their masses. Thiemens collaborated with John Heidenreich to demonstrate such mass-independent fractionation of oxygen isotopes in the formation of ozone thirty years ago, but until the current study, the mechanism for a similar process in forming the solid building blocks of rocks had not be demonstrated. Several competing theories have been put forward as possible explanations for the anomaly. One theory proposes that the mix of oxygen isotopes was different back when the earliest solid matter in the Solar System formed, perhaps enriched by matter blasted in from a nearby supernova. Another suggests a photochemical effect called self-shielding, which this team had previously ruled out. The final surviving theory was that a physical chemical principle called symmetry could account for the observed patterns of oxygen isotopes. Chakraborty tested this idea by filling a hockey puck sized chamber with pure oxygen, varying amounts of pure hydrogen and a little black nugget of solid silicon monoxide. A laser was used to vaporize a plume of silicon monoxide gas into the mix. This mixture of ingredients is observed by radiotelescopes in interstellar clouds, the starting point for our Solar System. The oxygen and nitrogen reacted with the silicon monoxide gas to form silicon dioxide. This solid, which is the basis of silicate minerals like quartz that are so prevalent in the crust of the Earth, settled as dust in the chamber. The earliest solid materials in the Solar System were formed by these reactions of gases. Chakraborty worked with Petia Yanchulova, a physics student, to collect and analyze the dust. They found a mix of oxygen isotopes that matched the anomalous pattern found in stony meteorites. The fact that the degree of the anomaly scaled with the percentage of the atmosphere that was hydrogen points to a reaction governed by symmetry.